The big winner is that 44% of you worry that attendance will drop as everyone heads off for vacation. No worries, the numbers will go back up by September. 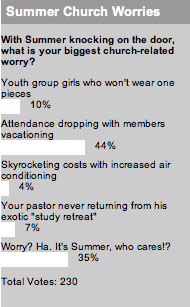 Far less of you are worried about youth group girls not wearing one pieces (10%), your pastor never returning from his study retreat (7%), and skyrocketing costs of air conditioning (4%). The good news to me is that 35% of you are just kicking back and shooting the breeze, enjoying the summer. Given that it’s already almost June, summer planning is winding down, and it’s time to move to the camp of not worrying about tomorrow. Here’s us at CMS wishing a great summer and safe traveling to all of you, but remember, we don’t take summers off. So this week, head on over and keep voting in our polls, we’re asking you what would make you leave a church. is church the only place where people are expected to forsake their much-needed vacation time. when did attendance become a measure of spiritual maturity. how about budgeting for the “expected” summer drop in numbers instead of needlessly worrying about it.